My Service Dog Was Taken Outside 7 Eleven. 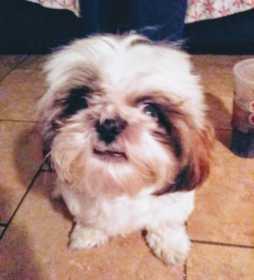 Beautiful Shitzu Brown And White Last Seen At Owens And Civic Center/ Eastern 89101 . She Was Wearing A Pink And Grey Flannel Jacket And Has A Pink Collar With A Bow On It. Please Contact Me If U Have Any News Im Dying!! !